Home / Blog / Looking for a better, easier way to do greenhouse IPM? Greenhouse Scout mobile app developed by the New York State Integrated Pest Management Program at Cornell University initially began as a how-to notebook for greenhouse ornamental plant growers. 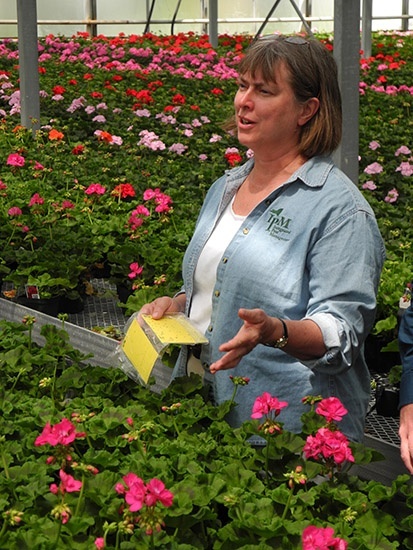 “Incorporating beneficial organisms for insect and mite management in greenhouses is not something that growers can just jump into,” said Elizabeth Lamb, ornamental IPM coordinator at NYS IPM Program. “A lot of information is required for someone trying to successfully do biocontrol. Once it becomes part of the production system it can work, but getting started is the hard part. We didn’t see one good way of putting all of the information together in a relatively easily accessible format. Elizabeth Lamb, ornamental IPM coordinator at NYS IPM Program, worked with GORGES Inc. to develop the Greenhouse Scout app. NYS IPM Program staff began working with GORGES Inc. in Ithaca, N.Y., to develop the app program. The funding to create the app came from a USDA National Institute of Food and Agriculture grant. Although the Greenhouse Scout app was developed for greenhouse ornamentals, it has application to other protected environment crops. Lamb said that even though the app was initially developed for greenhouse ornamentals, it could be used with greenhouse vegetables and other protected environment crops. Lamb said even though growers are good about identifying pest problems on their plants, they can have a difficult time tracking the data, especially from year to year. One of the biggest scouting gaps the app can help eliminate is determining the effectiveness of pesticide and/or beneficials applications. Although scouting information is being written down on paper or in a notebook, Lamb said having all of this data doesn’t indicate whether beneficials and pesticide applications are working. “Growers might have a general idea if they are seeing fewer or more of a particular pest from the previous week,” she said. “The app offers growers the ability to look at the scouting data on graphs so they can see whether the pest numbers are going up or down. This gives growers more information to use in terms of deciding what to do. Greenhouse Scout offers growers the ability to look at scouting data on graphs so they can see whether pest numbers are going up or down and whether a control application is effective. Lamb said being able to print the graphs enables growers to keep a running record of what has happened with their crops in previous years. Lamb said the app was designed to be used in all size greenhouses. “If growers have an internet connection the recording of the scouting data to their computer is automatic,” she said. “If growers don’t have an internet connection in the greenhouse, the app holds the information until the connection is made. It doesn’t have to be plugged into something else. The data is synced directly into the computer. If there are four workers scouting simultaneously in different greenhouses, they can input data on the same account. Growers could sit in their offices looking at what is going on with pest management in all of those greenhouses at the same time. Lamb said she has received requests to translate the Greenhouse Scout app. She is currently working with GORGES to find out the costs involved with translating the app into Spanish and French. She is also working on apps for conifers and greenhouse hops that will include both insect and disease pests. For more: Elizabeth Lamb, NYS Integrated Pest Management Program, Cornell University, Ithaca NY 14853; (607) 254-8800; eml38@cornell.edu; https://nysipm.cornell.edu. NYS IPM’s Greenhouse Scout is available for $9.99 at the Android and iPhone app stores.